Veteran entrepreneur and award-winning author Jack Nadel has been named the first recipient of the Scheinfeld Center for Entrepreneurship & Innovation's new "ELNA" award at their upcoming Enlightened Entrepreneurship Series event. 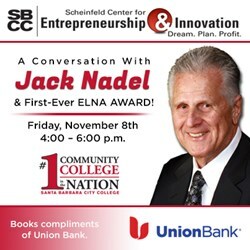 Decorated WWII veteran, entrepreneur and award-winning business author Jack Nadel has been named as the inaugural recipient for the “Entrepreneurial Lifetime Notable Achievement Award,” presented by Santa Barbara City College’s Scheinfeld Center for Entrepreneurship & Innovation. The upcoming installment of their Enlightened Entrepreneurship Series will feature Jack Nadel, founder and chairman emeritus of Jack Nadel International, on Friday, November 8, from 4–6 p.m. at the Fé Bland Forum, which is located on SBCC’s West Campus. The award event will include a special on-stage conversation with Nadel where attendees will hear firsthand about his nearly seven decades of successful experience and his deep-seated desire to share what he’s learned with others through appearances and writing, including insights from his award-winning book for entrepreneurs, “The Evolution of an Entrepreneur,” winner of five 2013 Global Ebook Awards including three Gold Awards for BEST in Business, Leadership and Careers/Employment. Nadel, who celebrated his 90th birthday earlier this month, will receive the first-ever Scheinfeld Center’s Entrepreneurial Lifetime Notable Achievement Award, also known as an “ELNA” award, to honor his tenure as a global entrepreneur and for his passion to foster entrepreneurship in others. The award’s name was inspired by Elna Scheinfeld and her late husband, James D. Scheinfeld, for whom the center is named, whose vision to encourage and support the development of new businesses, promote entrepreneurship, and assist existing businesses in Santa Barbara was born from a genuine regard and commitment to equal access of educational opportunities for all individuals. The audience will have an opportunity to personally interact with Nadel and network during a reception following the presentation and award ceremony. All attendees will be gifted with a copy of Jack Nadel’s award-winning new book, “The Evolution of an Entrepreneur,” sponsored by Union Bank. This event is open to the public and is free of charge. However, space is limited and RSVPs are required. To register for the event, please go to: http://scheinfeld.sbcc.edu/events_lectures.html. Media professionals wishing to attend are encouraged to contact Amber Sims at Media[at]JackNadel[dot]com or 805-403-2889 to reserve VIP/Media seating. Virtual and telephone interviews with Mr. Nadel are available before and after actual event. For more information on veteran entrepreneur and business author Jack Nadel, visit http://www.JackNadel.com.